We install bi fold doors to homes in Hale and throughout Altrincham Cheshire working on many new build homes, designer homes and many terrace homes to open up space and bring in more sunlight to your home. Our installation team have years of experience in designing, planning and installation of different types of bi folding doors systems in the Hale area of Cheshire working with only the best manufacturers in the industry and with glazing to suit the needs of your home. 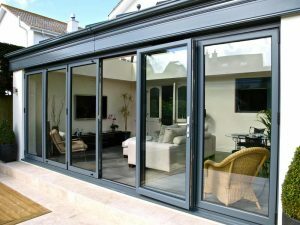 Our team are specialists in bi folding doors and glazing and understand the Hale and Bowdon housing market and styles. After installing many bi folding doors in homes and businesses in the area, we have built our reputation as being a premier Hale and Bowdon Bi Folding Door installation company. We spoke to many companies in the Hale area, but Alphamet stood out. They clearly knew what they were doing and I was so impressed with the types of glazing and the past bi fold door installations they had done. The process was slick and before we knew it, we had our new bi fold doors in and we absolutely love them! Bi fold doors are an excellent addition to any house, and can generally cater to almost any interior and exterior design choices. In addition to being modern, neat and capable of completely folding away behind curtains or a bulkhead, they offer a wide variety of benefits that other doors and windows simply cannot. So let’s take a closer look at precisely what kinds of benefits one can expect when choosing to install bi fold or concertina doors within any Hale or Bowdon home. For many people, the two favourite spaces in the home are the living space and the outdoor recreational area. These two spaces are often the centre of attention when hosting parties or gatherings, and bi fold doors allow the utilisation of both these spaces simultaneously. Rather than having walls blocking the view or sliding doors that can become hazardous obstacles, these doors can create a more open feel between the lounge or dining hall and the patio, poolside or garden. In many Hale or Bowdon homes you see this interaction with the outdoor space in all sizes of homes. There’s nothing that makes a home feel warm and cozy like natural light flowing in during the morning or late afternoon hours. With bi fold doors in Hale or similar locations, one can enjoy this natural light without having to endure the heat, cold or wind that may currently be happening outside. Instead, large concertina windows provide the protection from harsh natural elements while occupants can enjoy an amazing view, as well as all the natural light they need. One thing that really sells a home is the light, nobody wants to live in a dark space, but light changes the mood of the property and adds value to the property too. Aside from aesthetic benefits, bi fold concertina doors can also offer more safety and flexibility in how living spaces can be utilised. Because each panel has its own separate locking mechanism, the entire door is far more secure than one which is hung on hinges and a single lock. Additionally, these locks allow occupants to open the doors to any size, to accommodate hot, cold or even windy days whenever necessary. There are few other doors and window designs that offer aesthetics, security and flexibility, and even fewer that provide the above benefits as well. Security is paramount to your Hale home and our doors are built to protect. Whether installed in a state-of-the-art modern mansion or within a cozy little abode, bi fold and concertina doors can accommodate almost any needs while complementing almost any home designs. Just be sure to search online for great reviews and price comparisons to get the best deal for your money.